A blood chart to determine each donor's blood type before they proceed to the donation. 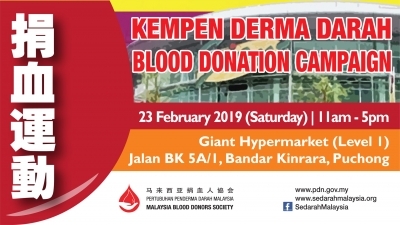 Despite the increase in the number of blood donors in Malaysia, Deputy Prime Minister Tan Sri Muhyiddin Yassin recently stated that only 2.5% of Malaysians were blood donors, well below the international average of five percent. MOB takes a look at some facts and figures about blood donation. 1) There are two types of blood donation — whole blood and apheresis. 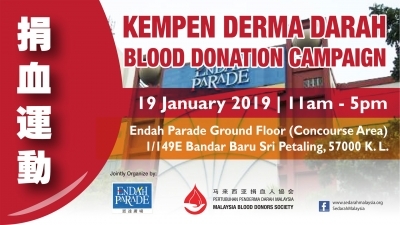 “Apheresis is costly but effective as we are able to separate the components for specific purposes,” said Dr Norasrina Ishak, head of National Blood Bank blood procurement division. The whole blood donation takes 30 minutes and can only be done once in three months. In comparison, apheresis donation takes over an hour and can only be done at the centre due to machine availability, but an apheresis donor can donate once every two weeks. 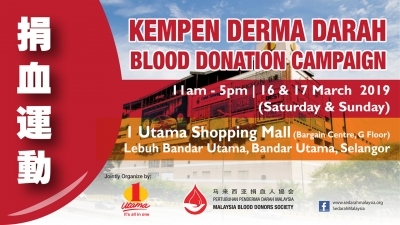 2) Altruism is the top reason driving Malaysians to donate blood. According to a survey by the National Blood Bank, many come forward because of a genuine desire to help others. Retiree Low Cheng Har, 60, was doing an apheresis donation when MOB visited the National Blood Bank. It was Low’s 331st apheresis donation, having been a blood donor since 1994. She takes the bus from her home in Bandar Sri Damansara, Petaling Jaya, to get to the centre in Kuala Lumpur. “I’m motivated by a sense of wanting to help others. If I were in the patient’s shoes, I hope others would do the same for me,” she said, adding that her husband and sons were also regular blood donors. 3) There are many benefits to being a blood donor. Apart from helping others, regular blood donors also receive benefits in return. Malaysians who donate twice in a period of 12 months are entitled to a free Hepatitis B vaccine shot. Those who donate more than 50 times (whole blood) and 150 times (apheresis) are entitled to free outpatient treatment at any government hospital. Should they be warded, they will be entitled to a free first-class ward for the first 10 years, and second-class ward after. Regular blood donors also enjoy free health screenings every six months. 4) Misconceptions about blood donation. Dr Norasrina said some of the reasons cited by the public for not donating blood were fear of needles, fear of the sight of blood and, surprisingly, fear of gaining weight. “Some people have a misconception that they will eat more after donating blood because the body needs to be ‘replenished’, but this is untrue so donors should not worry,” she said. “We sterilise our needles properly so there shouldn’t be a fear of infectious diseases,” she said. 5) Four to five hundred units of blood are needed in a day. One unit is about 450ml of blood. The National Blood Bank collects 3,200 units of blood in a week. 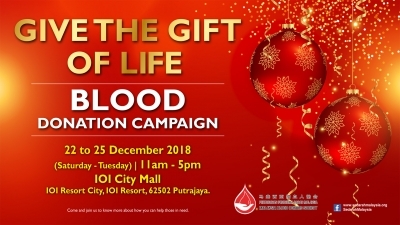 The collected blood is supplied to government and private hospitals in the Klang Valley, while in other states it is provided by the respective state blood banks. “Eighty percent of donations come from mobile clinics. Apart from our own donation drives, we also work with various corporations, schools, non-governmental organisations and other government bodies. “The amount of blood one can donate depends on the donor’s weight. “If you are below 50kg, you either donate 250ml or 350ml; and 450ml if you are 50kg and above,” said Dr Norasrina. The donated blood is quarantined and sent to screen for hepatitis B, hepatitis C, HIV and syphillis. Once the green light is given, the blood is processed into components – plasma, platelets and packed cells (red blood cells), which are then distributed to hospitals or stored. 6) One blood donation can save three lives. This is a tagline used by the National Blood Bank to encourage blood donation. The reason is because there are three components in the blood which serve different functions. For example, platelets help dengue patients who are low on platelet count. It is also used for patients undergoing chemotherapy. Red blood cells carry oxygen and are important for blood transfusion in cases of accidents, operations, thalassemia and heavy bleeding; whereas plasma, which contain blood-clotting factors, can help burn victims. “This is one of the reasons why we encourage apheresis donation because it is more specific,” Dr Norasrina explained. “It takes four to six random whole blood units to extract the same amount of plasma or platelets used for one patient’s treatment. In apheresis, the ratio is one donor to one patient. This reduces the risk of adverse reactions,” she added. 7) Blood type “A” tends to run short. Despite about 25% of the population having A blood type, it often runs short in the blood bank. Registration division head Rosalind Choo said it was possible that many A-blood type donors were not aware or were not coming forward to donate. “Blood donation levels tend to see a drop during festivals and school holidays, but we have a forecasting system and we plan ahead to make sure there are always stocks in hand,” she said. 8) Blood banks need a continuous supply of donations. 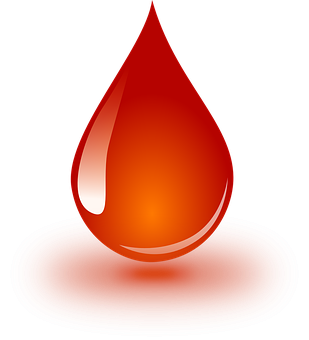 Red blood cells can last 42 days maximum, while platelets can only be kept for five to seven days. Plasma can be frozen and if kept in the right conditions, can keep well for years. The short lifespan of some components is the reason why the blood bank is constantly in need of supply. “Red blood cells have a lifespan of about 122 days in the body, of which then they will die and be replenished. Instead of letting it go to waste, donating it can help to save lives,” said Dr Norasrina. “Many of our donors also report feeling fresher after donating blood,” she added. 9) The largest demographic of donors in Malaysia are between the ages 18 and 30. Dr Norasrani said most donation drives were currently focused in urban areas. “If we reach out to the rural areas, the number of donors will definitely rise. “In 2013, we collected 670,000 units nationwide. Our aim is to get a consistent supply throughout the year,” she added. Other outreach programmes include regular campaigns in schools and universities to instill awareness from a young age. 10) I want to be a blood donor. Now that you’re all pumped up to do your part for charity, here is what you need to fulfill to get started. A donor has to be between 18 and 60 years old, healthy and weigh 45kg and above. They must not have been on medication recently or have any congenital diseases. The night before donation, they must get a minimum of five hours of sleep. A healthy lifestyle is essential. Those aged below 18 must get parental consent.